Ringworm is highly contagious from animal to animal and even humans. If you suspect your horse has ringworm, call your veterinarian and start a ringworm treatment right away. 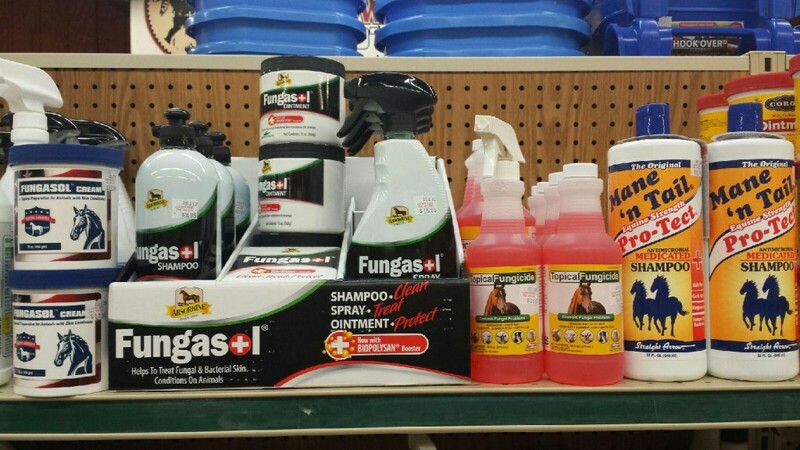 Ringworm sores can be treated to prevent spreading with topical options like Fungasol Spray, Topical Fungicide, and Fungasol Cream. Make sure to clean all tack, bedding, stables and keep your horse in isolation until ringworm is gone. Stop by Lochte Feed and General Store in Fredericksburg, TX today for all your equine needs including animal health treatments and vaccines. We carry high quality feed, supplies and tack at great prices. Shop local and come by! This entry was posted on Sunday, June 18th, 2017 at 4:37 pm	and is filed under News & Updates. You can follow any responses to this entry through the RSS 2.0 feed. Both comments and pings are currently closed.